Thomas Reid (1710-96), the Scottish natural and moral philosopher, was one of the founding members of the Aberdeen Philosophical Society and a significant figure in the Scottish Enlightenment. 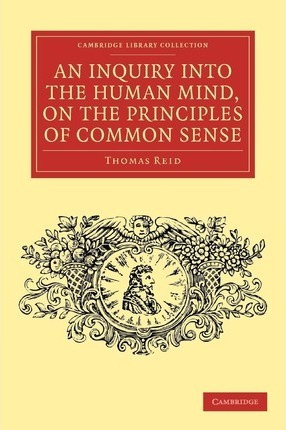 Reid believed that common sense should form the foundation of all philosophical inquiry. He criticised the sceptical philosophy propagated by his fellow Scot David Hume and the Anglo-Irish bishop George Berkeley, who asserted that the external world did not exist outside the human mind. Reid was also critical of the theory of ideas propagated by Locke and Descartes, arguing that it was incompatible with physical and experiential facts. For Reid, our senses demonstrate that the external world must exist, and this work is organised in chapters examining each of the senses in turn. The book, based on his lectures, was first published in 1764 when Reid was a regent professor at King's College, Aberdeen, and was reissued in 1818. 1. Introduction; 2. Of smelling; 3. Of tasting; 4. Of hearing; 5. Of touch; 6. Of seeing; 7. Conclusion.